Teen to Adult; able to modify. PATTERN IS PART OF A KIT for purchase at Wishing Stones Gallery on Big Tancook Island. PM designer for details. In the Maritimes, lobster can be both loved or loathed, and one’s livelihood or one’s undoing. Regardless, they are an important (and delicious) part of East Cost life. With this important mascot in mind – particularly on Big Tancook Island in the waters of Mahone Bay, off Nova Scotia’s magical South Shore – the design took shape for these whimsical and WARM slippers. Gauge and size can be altered with moving from a Navajo three ply, to a double-strand, to single strand of locally spun Briggs & Little’s Heritage or Tuffy yarns, both of which come in a deliciously rustic hand-feel perfect for drizzly days and chilly nights of later fall and winter. 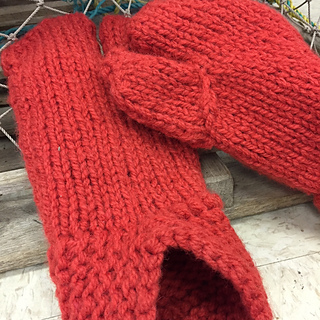 The pattern sample was knit with a Navajo 3-ply (Lucy Neatby’s great video instruction can be found here: https://www.youtube.com/watch?v=X1-ZAuw0tik) and a birch wood 7 mm double-pointed needle set (a very Canadian size) from the also-local Lismore Farm’s River John Needle Company. Feel free to play with your yarn and needle choices to size the pattern up or down. Mimicking a lobster claw, there is a good amount of toe room (creating a warm pocket of air! 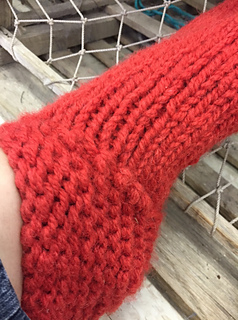 ), and the slipped-stitch garter stitch heel is designed for durability, and to wrap around the heel back and ankle joint for a good fit. The pattern takes 2 hanks of Briggs & Little’s Heritage or Tuffy (or equivalent, as the Navajo ply offers some play), about 400-430 yards, and 7 mm needles. Choose a joyful red, or something a little more akin to the rock-coloured creatures when they’re in the water.